Start the day with a hearty, vegetarian full breakfast, made with fresh, seasonal ingredients from our organic gardens or from local or sustainable producers. Homemade breads, zucchini-feta pancakes, breakfast burritos and fruit smoothies are among our house specialties; they're the perfect energy boost, whether you're heading out on a bike ride or a tour of the Frank Lloyd Wright homes in Spring Green. Click here for a sample menu of our breakfast items and appetizers that may await you, depending on your arrival time and/or season of the year (the menu is a PDF file). Vegan and other dietary needs are happily accommodated with advance notice. Nibble your way through a hands-on tour of our organic fruit, vegetable, and herb gardens. Learn about permaculture design, a concept originally created "Down Under" by Bill Mollison. A portion of the property has been used for previous sustainable agricultural internship programs from time to time, like Janet House's cut-flower business, Simple Abundance Farm. Restfully dream, snuggled under organic cotton linens. You'll also find naturally soft, unbleached towels in the renovated, water and energy-conserving bathrooms with water heated by the sun. Plug in your electric or hybrid plug-in electric vehicle and recharge it with 100-percent renewable energy! As of December 2016, Inn Serendipity is a partipant in the Tesla Destination Charging program, offering free electricity for guests who arrive in a Tesla electric car as well as any guests with either all-electric or plug-in hybrid electric vehicles. Both a Tesla Wall Connector and Universal ClipperCreek Connector is available for guests to use to recharge their vehicles with 100-percent renewable energy. In the summer, play a game of outdoor chess with our life-size chess set; in the winter, snuggle next to our woodstove after cross-country skiing from our back door to the "Rohde Woods." 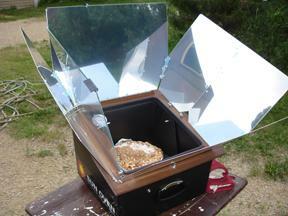 Depending on the sun and your arrival time, savor an appetizer cooked in a Global Sun Solar Oven. Take a selfie with Yoda or a Stormtrooper from Star Wars...painted on the side of one of our outbuildings. Snap a photograph of our "barn quilt" that adorns the north face of our historic dairy barn. You can also tour all of the farms in Green County with a barn quilt. Borrow our sketch pads and paints and find a quiet corner to reconnect with your artistic side, perhaps finding inspiration next to our pond. Relax on our front porch while sipping lemon balm iced tea, made with herbs from our garden. Don't worry, you can keep connected to the web with complimentary WiFi Internet service, though it's not as fast as it is in the big city (or on a college campus). Learn about ways to create a more sustainable, socially and environmentally sensitive home. We are committed to creating a lifestyle at Inn Serendipity that is low-impact and that works with, rather than against, our natural surroundings. A solar hot water heating system, LED and compact fluorescent light bulbs and simple water aerators are some examples of the energy-saving technologies we employ at the Inn. 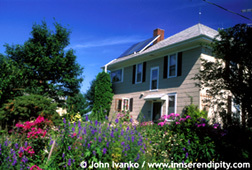 Inn Serendipity has been designated a Real Goods demonstration home -- as a showplace for energy conservation and more ecologically responsible living. The Inn received the 2004 Energy Star Small Business Network Award from the EPA for its approaches to energy conservation, efficiency and renewable energy generation. Use our binoculars and guidebook and make friends with the variety of colorful birds and shy critters that call our backyard home. We're striving toward restoring the land to its original diverse form while supporting our food needs. Deer, chipmunk, raccoon, woodchuck, and rabbit forage our grounds while bluebirds, woodpeckers, Great Horned owls, orioles, and robins soar overhead. And our list keeps growing, as do the flora we keep adding to the property. Stretch out with several floor pillows in our "pillow room" and explore our extensive and eclectic library of reading materials and resources, ranging in topics from environmental issues, career/life development, travel, creativity and women's issues. Take a read of the books we've authored on entrepreneurship, travel, children, and environmental issues.